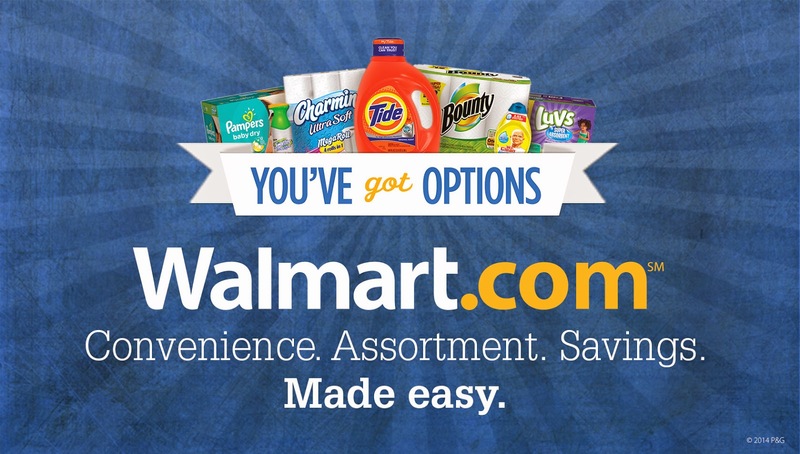 Shopping for household essentials is now a breeze at Walmart.com and/or the Walmart Smartphone app. Shopping can be fun... if it's for shoes!! 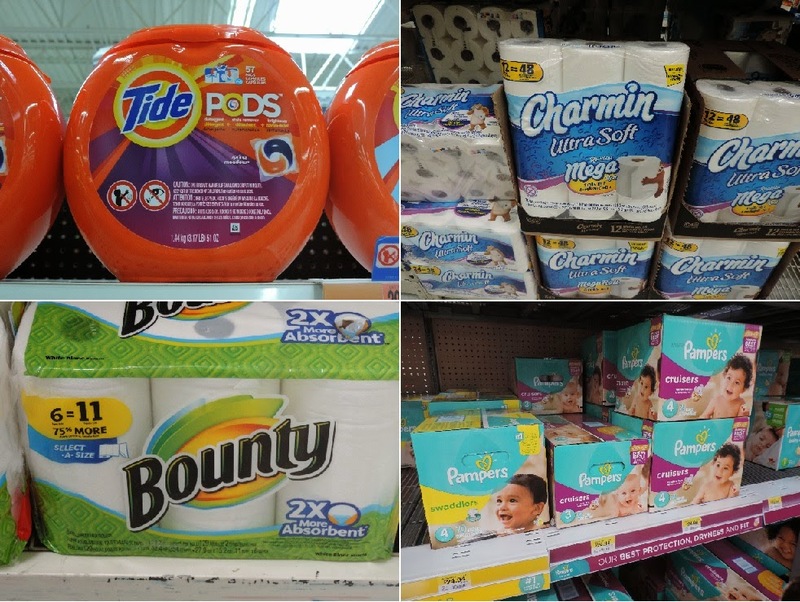 Shopping for household essentials, can be just meh, and sometimes it's even difficult to find a way to fit it into your day (but you've gotta have your favorite laundry detergent, so you go). Out with the old way of shopping! And in with the new! All orders over $50 ship free! including your favorite Procter & Gamble household items. 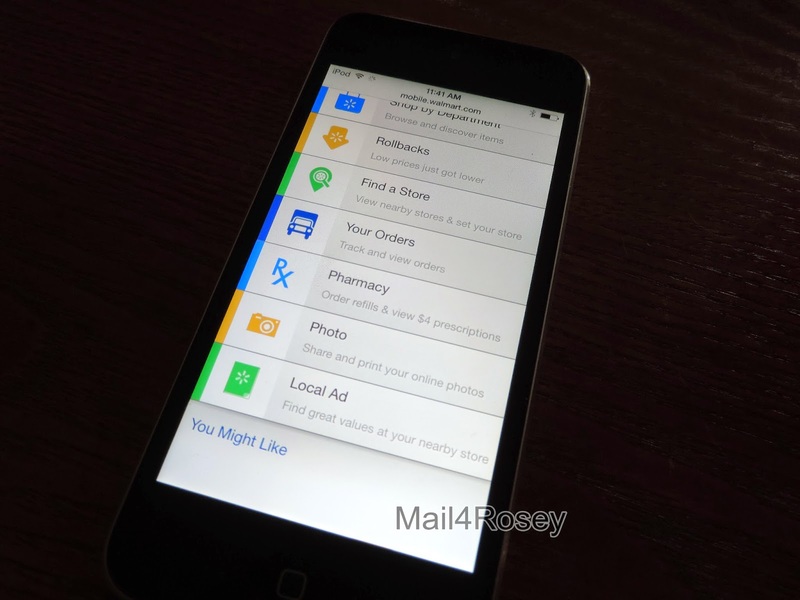 The Walmart Smartphone app is convenient and useful in more ways than one. Imagine that instead of getting the kids ready to go, buckling them in their car seat, and repeating at the store and on the way home, you could sit at home with a cup of coffee, your feet kicked up, and your smart phone in hand, and get the same results. Anything you want to order, like Procter & Gamble Tide Pods (we recently picked up the Spring Meadow scent), Bounty Paper Towels (they have a select-a-size option), your Pampers Cruisers, or even a box (or twenty) of Swiffer Dry Sweeping Sweeper Cloth Refills can be sent directly to your home. 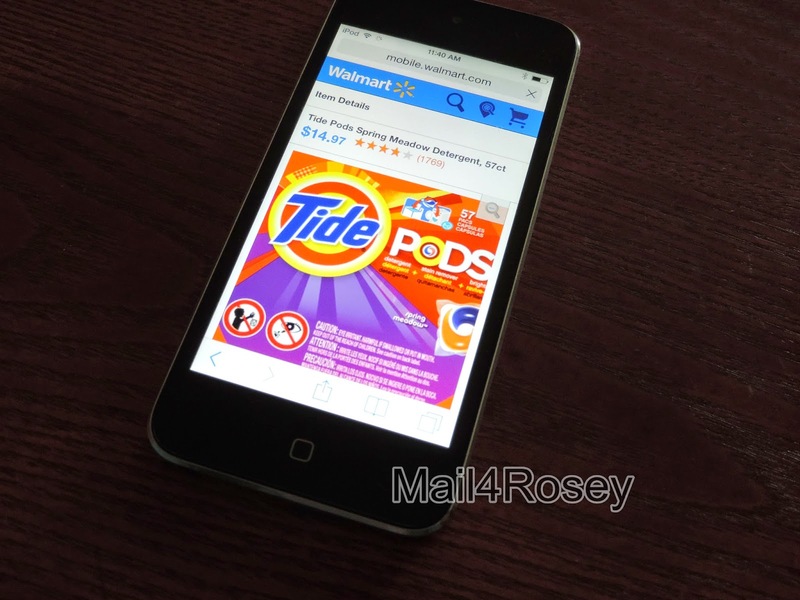 with the convenience of the Walmart Smartphone app shopping you'll come to love! to help make your shopping easier! You can also shop at Walmart.com to have items delivered to your home or in-store. Hubby and I don't have smartphones (two of the few people left who do not, I know) and we still found online shopping a breeze to use on my husband's handheld electronic device (shop at walmart.com or use the app). We placed an order for our favorite items, used the convenient check out, and had the items delivered to our front door (orders over $50 are shipped free). Easiest shopping we've done in a long time. The benefits of the Walmart Smartphone App are plentiful, and I can see this type of shopping becoming the norm for many today and in the future. Won't you try the Walmart Smartphone app today? To make it even easier, one lucky winner will get a $25 Walmart gift card. I like that you can quickly reorder prescriptions from the app. I don't even have a phone. Gave up my cell when I retired and never looks back. Never owned a cell myself....never have missed having one either..
That sounds like a great deal to me. I hate having to drag my kids into the store when I don't have to. I like that you can find a product's price and availability both online and in your store. Ordering my Hubs perscriptions is a huge thing. When he was home right after his knee replacement, I had a heck of a time trying to take care of him and run for his meds too. This is a great service. Especially for those who have trouble getting out. Great giveaway too. That you can also refill prescriptions through the app. I learned that you can see the weekly add with this app and that you can check price and if an item is in stock. I learned: One can get fast, easy refills; reorder prescriptions then pick up in-store. I would buy Procter & Gamble's Professional Joy Manual Pot/Pan Detergent. there are so many great apps out there just like this one. Unfortunately my phone is a dinosaur and I really need to upgrade. I really like to reorder your prescriptions with the app. I like that I can easily check the weekly ad. That way I can easily see what's on sale that week. I might buy the Procter & Gamble Professional Mr. Clean Disinf All Pur P Clnr 32oz. I learned you can look at weekly ads. We shop at Walmart all the time, this may come in handy for me. Sounds like it could be beneficial, but I still prefer going into the store and picking the items myself. Check the weekly ad.. This actually sounds so easy.. I would probably spend less money using this vs walking through the store. I would get some Swiffer products. I like the idea of the price and sale alerts. I also really love the prescription feature. I could use this. I would ship for back to school things actually. All supermarkets should have an app like this. So useful! Oh, please please please could we get an app like this for some shops in Spain too. I don't like shopping much, so this kind of app would be perfect for me! I need to download this app. We shop at Walmart ALLLL the time! Thanks! Thanks for linking up with my NO RULES Party this weekend and for the tweet, tweet! You can get your prescription refills right from the app. So simple. Wow, that is impressive. I wish other stores had similar apps with all those capabilities. What a great app! It seems like they have apps for everything. There really is an app for everything. I'll have to check it out, we shop at Walmart often. There's an app for that! LOL If shopping can be made easy I'm all for it! Will check out this app for the next time I head over to Walmart! I like Tide, especially since it's such a longstanding reliable brand. My Mom used to use it. I like how companies are starting to integrate mobile apps into their services. It saves time and energy. I wish more companies & stores would do the same thing. I love this. Now I can keep a running Wal-Mart list on my phone as I think of things that I need. I love shopping online or through an app. My in-laws are avid Walmart shoppers, so I'll definitely be forwarding this along! I like that you can check pricing. I love shopping at Walmart.. too bad its only for iphone. I have an android. Walmart is the place to be. I bet this app just makes it all better. I like that you can see the weekly ad and also do a shopping list. I like that you can Find a product's price and availabilty both online and in your store. I would use it to buy Tide. I learned that the Walmart app will automatically access the weekly ad, store information, new items, Rollbacks and more when you enter the store. I would buy P & G's Cascade dishwasher soap. in-store and online specials first. That would be wonderul. I'm so glad to see stores embrace technology! I am definitely going to use this! I like that I can refill my prescription with the app. What?? I haven't even heard of this app yet. Crazy awesome! This will come handy when you are too sick to do the shopping at the store. I like it. I've never known about this app until now, I need to get it and try it! Great app! And I do love me some Tide. The neighbor did her laundry here when her machine broke and used my Tide. Her husband loved the scent so much, they ended up switching! Does Walmart also offer free wi-fi anywhere in the store? Sorry for my naive question as I'm not familiar with the environment. If not, then customers would have to get their own mobile data. My sister swears by this app and she keeps raving about this app. I would buy Pantene shampoo. the evolution of ecommerce. I am so happy how businesses use the technology for a more convenient way of shopping. You can refill prescriptions with the app! I love apps likes this. The fact that you can refill your prescriptions with the app. That can make it easy for those who have a hard time. Thank you for sharing! Thanks for the review on the app. I LOVE apps which gives you a great reason to use it. I love the free shipping option. Thanks I'll go check it out! Oh and thanks for the awesome giveaway! I learned that you can create a list and the app will tally your total so that you can budget before you shop. How awesome is that? I would use the app the buy some Febreeze Noticables refills and some Comet cleanser to clean my tub. Great app. I will have to check it out - I'm at Walmart every single week! 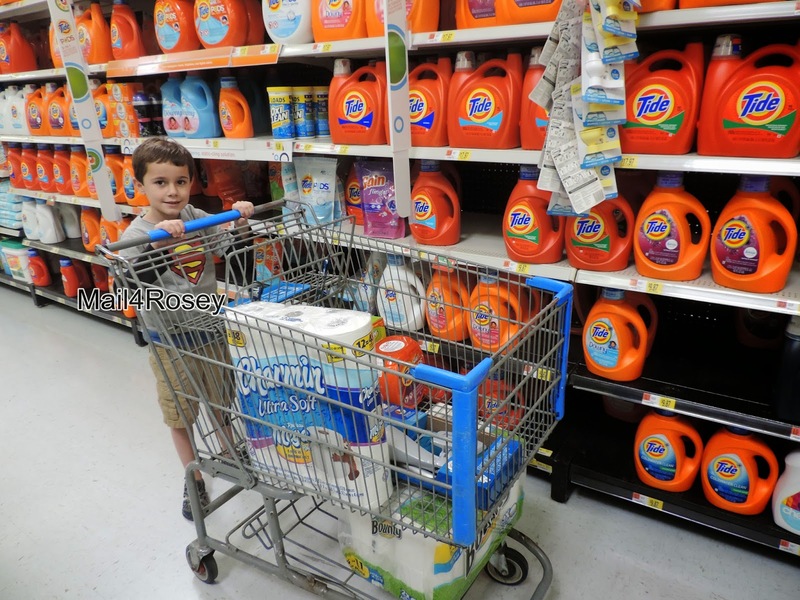 I love Procter & Gamble Tide Ultra Laundry Detergent in powder - it is my favorite. I like how it knows you are in the store and provides you with the weekly ad along with new items and rollbacks. Sounds like the app for me. I hate taking my kids shopping. I would get Tide Procter & Gamble Professional Pods PAG50949 Thanks! I learned that you can use the scanner app with it. my go to P&G item would be anything Tide. I like the prescription part of it. This would save so much time to be able to order them ahead of time and not have to wait. I like the easy refill part as well. I like the shopping list. I like that it will total your purchase before you buy. I would use the app to buy a Swiffer Wet Jet. I like that you can order and refill prescription so quickly. Our walmart is a popular pharmacy and the lines are always massively long. It would be nice to have an online service line. I bet it would speed them up some! I don't use it for that reason. I like that I can check prices and availability right from the app! It amazes me how many apps are out there that are for shopping at Wal Mart. Love all the pas they have these days. Love the ones where I can order online and then can go to the store to just pick it up. I really love that you can refill and schedule pick-up for prescriptions right on the app. That's very convenient! This is an awesome app for sure. I love you can have the stuff delivered right to the house and shop from anywhere. Thanks for sharing. I learned that you can refill your prescriptions through the app....that's awesome. I like that you can check pricing and availability via the app. I love that I can scan barcodees on products to compare prices and check store availability. There are actually numerous little things I like about this app. I like how the app recognizes the store you are in and gives you the rollbacks and sale items for that store. I also like how you are able to make a shopping list based on items available at Walmart. These are only two of many aspects of the app I find myself liking about it. I learned that you can see the weekly ad with the app. I like that you can find a products availability at a specific store. It saves me a shopping trip! I love the Procter & Gamble Professional Mr. Clean Disinfectant All Purpose Clnr 32oz bottle! I learned that I can find products on the app, and make sure it is carried at my local store. That is awesome! Will save me a bunch of time. I will buy some Procter & Gamble Commercial Original Liquid Dish Soap. I just realized I am close to running out. Yikes. You can quickly reorder prescriptions for pickup in the store. Tide, I love it so much. Love that they have an app now! I have been using cartwheel at Target- but then nothing at Wal-Mart! So glad they are joining in on the app fun! I like the feature of quickly reorder prescriptions then pick up in-store. I like that it recognizes when you're in a Walmart store. I learned that I can refill my prescriptions using my smartphone. Yipee! Thanks for the giveaway! I would use it to buy Swiffer Duster refills. Thanks for the giveaway! I like the Store mode. I think it is great to shop from your smartphone! If I had to still drag kids to the store you can bet I would have already downloaded that app! Sounds like a great deal thanks for sharing. That app offers some great features. I am going to have to try it! I like that it knows when you're in the store. I'd get one of the mops, I need a new one. I learned that you can look at their weekly add and check if an item is in stock. WOW! This app does EVERYTHING! I really like the shopping list feature!! I am ALL ABOUT the Gain Laundry Detergent & Fabric Softener!! I learned that you can use it to schedule and take control of your prescription meds. I don't have a Walmart near me, but that sounds like a very handy app. We don't use apps, but I guess the shopping list app is handy. What a great app! I love that the shipping is free after $50. That's an awesome inclusion. My husband loves Gillette razors, so that's what I would probably buy. Although I might also buy some Febreze products for my classroom! I like that it has a "store mode" that will show you the circular! I love that you can check the price both in the store and online. If I had a gift card for P&G items, I would buy Swiffer Dusters. I like the prescription refill ease. I like the early access notifications. I learned that it recognizes when you are in a store and provides easy access to store information. I would buy replacement pads for my Swiffer Wet Jet. I like you can Find a product's price and availability both online and in your store.. I like that you can use the app to refill prescriptions. I buy Tide all of the time. Love! You can access the weekly ad. I love that when you walk into a Wal-Mart store it shows you the weekly ad, new items, and information. There's lots of great things about this app. One I like is that you can browse or search in the app to see what others are saying about specific products. I learned that you can order prescriptions right through the app! I like the fact that you can use it to scan bar codes and check for deals. I like the shopping list feature. You can refill prescriptions easily. I like how I can find things on the shopping list. I would buy things on sale and stock up. Use the app's built-in scanner in or out of the store to access product information, price, ratings & reviews and additional content. I learned that you can see your store's weekly ad on the app. I learned the app is available for iPad - so, it's viewable in landscape mode. That's a deal maker for me, as I do all my viewing this way. I like that I can view the weekly ad from the app! I like that it has a scanner function for verifying prices! I'd buy the Cascade Dishwasher Pacs. I found out that you can pre-order refills for prescriptions! Quickly reorder prescriptions then pick up in-store.